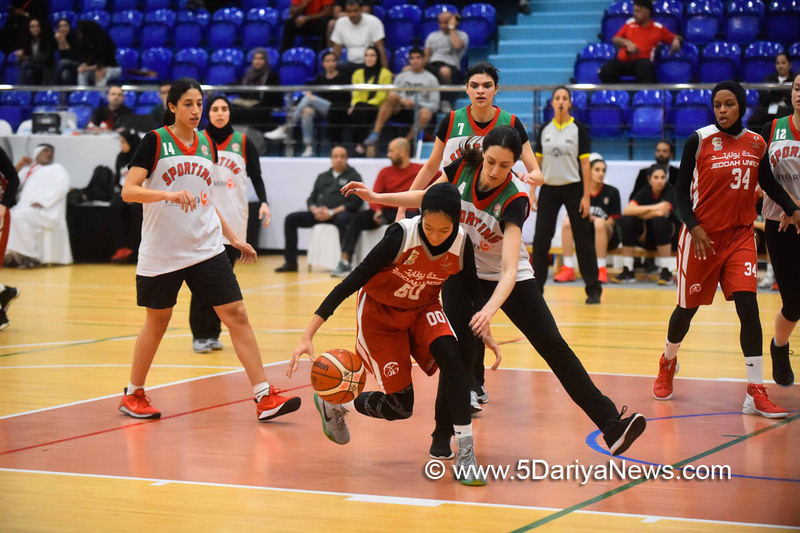 Egypt has placed itself at the top of the table after a convincing win against KSA’s Jeddah United with a score of 108-68, in the sixth round of basketball competitions in the fourth edition of the Arab Women Sports Tournament 2018 (AWST).The fourth edition of this prestigious tournament,which is the largest women’s sports event in the Arab world, is being held under the patronage of Her Highness Sheikha Jawaher bint Mohammed Al Qasimi, wife of His Highness the Ruler of Sharjah and Chairperson of the Sharjah Women Sports Foundation (SWSF).The sixth round also saw Sharjah Sports Club and AL Fuhays Club head to head, for a spot in the championship final after Sharjah defeated Bahrain’s Al Mawaheb with a score of 78-66, and Al Fuhays emerged victorious, beating Kuwait’s Al Fatat with a score of 74-70.With the conclusion of Round 6, Egypt is the only club that has remained undefeated with eight points from four consecutive victories and securing the top of the table, and the only club that got past the +100 points difference. In second place with seven points each are the Sharjah and Al Fuhays clubs. However, Sharjah is in the lead given the 109-point difference it accumulated over other teams in the preliminary phase with a score of 325 to 216.Al Fuhays ranks third lagging 25points behind Sharjah, and Al Mawaheb has finished fourth only six points away. Al Fatat also got six points but was knocked out of the tournament, losing the opportunity to secure second place, along with Jeddah United who also left the competitions, finishing last with five points.Egyptian ladies have dominated the court from the very beginning, and won the first three periods of their match against Jeddah United, winning first, second and third periods with scores of 36-10, 17-10 and 32-16. The Saudi ladies were able to win the fourth period with a score of 32-23,yet not enough to change the result of the match.Sharjah put an end to the ambitions of Al Mawaheb in their match that identified the club who secured second place and qualified for the finals. The hosts won both first and second periods with scores of 19-11 and 17-11, securing the first half 36-22. In a strong comeback, the Bahrainis tried to level up, winning the third period with a score of 25-20, which triggered the Emiratis to push back and win the fourth period 22-19, and the match 78-66.Al Fuhays escaped Al Fatat’s trap who won the first period, managing to come neck-to-neck in the second, and won the third period with scores of 20-18, 22-16. The Kuwaitis registered a win in the fourth period with a score of 21-16, but it was not enough to secure them the match that ended with a score tally of 70-74 points.The qualifying clubs are currently on break, and in preparation for the big final on Monday evening, February 12. The final day matches will determine the final three positions for the three qualifying finalists: Egypt, Sharjah and Al Fuhays.